For years Downing Street was allegedly beset by the "TB-GBs" - legendary rows between Tony Blair and Gordon Brown. But it now appears that GB - without TB - has found another often-heard acronym to care about: the Bee Gees. Band member Robin Gibb told The Times that the prime minister played their songs "every day", adding: "Gordon likes our music and I like him." Mr Brown's spokesman was less effusive, conceding only that he "listens to a wide range of music". The Bee Gees, or Brothers Gibb, are thought to have sold more than 220 million records, their hits including Night Fever, Tragedy and You Win Again. Mr Gibb, a Labour supporter, said the prime minister had told him: "Your music is absolutely timeless." He added that Mr Brown, who has recently stressed repeatedly the need to make "long-term decisions", rather than think about day-to-day tittle-tattle, admired the band's work "because it talks about human relationships and experience rather than specific events and reaches out across the decades". But Mr Gibb declined to say which of the band's many hits, with their trademark disco beat and falsetto singing, the prime minister liked most. 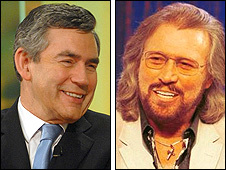 It is not the first time the Mr Gibb has been involved with leading politicians. In 2006, Mr Brown's long-serving predecessor Tony Blair stayed at his Florida mansion. Mr Brown, who used to holiday in Massachusetts - the name of another Bee Gees hit - but now prefers to stay in the UK, has come under fire over his alleged musical tastes in the past - possibly explaining his spokesman's tight-lipped remarks. Two years ago he mentioned Sheffield indie band the Arctic Monkeys in an interview, but was unable to name any of their hits when asked about them later. Mr Brown's only comment was: "They are very loud."